The composition and effect of NEKTON-Rep-Color matches that of NEKTON-Rep, with additional colorants to prevent the color of the reptile fading or to achieve a more intense color. NEKTON-Rep-Color is a high-quality multi-vitamin compound that matches NEKTON-Rep in its composition, and additionally contains canthaxanthin and apocarotenal. These substances are responsible for coloring the body, among other things and are deposited evenly in fatty tissue, shells and/or skin by administering NEKTON-Rep-Color. NEKTON-Rep is soluble in cold water and is easily administered in drinking water, or as a powder via the live feed. 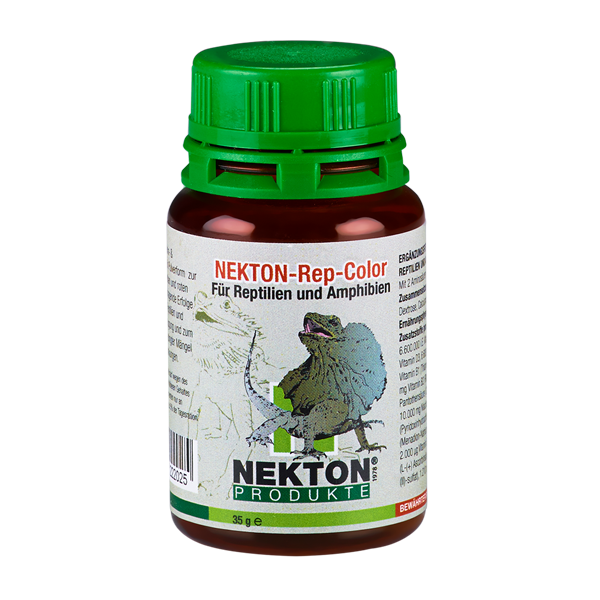 NEKTON-Rep-Color achieves a more intense color in reptiles and the often dreaded color fading is avoided by using NEKTON-Rep-Color. Canthaxanthin and apocarotenal are colorants that are also produced naturally and are therefore harmless. NEKTON-Rep-Color should be administered when needed, regularly over a certain time period, i.e. daily. If the desired color intensity is reached, the compound should be replaced with NEKTON-Rep. Usage and dosage same as NEKTON-Rep.
NEKTON-Rep-Color is primarily an extremely high-quality vitamin compound which, due to its high proportion of "epithelial protection vitamin" A (retinol), takes over a hugely important function by developing reptiles' and amphibians' skin and mucous membranes. Molting difficulties and skin disease are very common for these groups of animals, which are signs of an inadequate supply of essential vitamins and minerals. Amphibians and reptiles are vertebrate like their aquatic ancestors. Only a small amount from the abundance of orders, families, genera and species from prehistoric times have remained, however a total of around 9,000 species still offer a variety of shapes, colors and characteristics. Today's reptiles and amphibians can be found on all continents and reside in a wide-variety of habitats. Amphibians have not yet been able to fully break away from their ancestors' habitat. As their skin does not have sufficient protection against evaporation, they still mainly have to live in water or near it in damp areas so they do not dehydrate. Even though a few reptiles are water dwellers, their offspring evolve without this interim stage and hatch from eggs as miniature versions of their parents. In most cases, reptile embryos develop fully within the egg and hatch during or shortly after delivery. Because the freshly hatched/new born young animals breathe air and also have a solid protective skin, unsuitable for letting the skin breathe, eggs and young animals must be deposited on land. The requirements that must be fulfilled to keep and preserve amphibians and reptiles are diverse. You must first learn as much as possible about the animal's natural habitat to adequately adapt the terrarium. If it is not always possible to fully recreate the natural habitat, you can also keep the animal in the best possible health and ready to reproduce. The most basic conditions for this are: Light, temperature, air, space and nutrition. The requirements of our terrarium animals' types of food are very different. Amphibians are mostly carnivores. Reptiles are carnivores, herbivores or omnivores, depending on the species. Whatever it likes, the most crucial part of nutrition is its ingredients: Carbohydrates (starch, sugar, raw fiber), fats, proteins, minerals (major and trace elements), vitamins, water. Carbohydrates supply energy. A total lack of carbohydrates can damage the composition of the intestinal flora and can result in disruption of vitamin synthesis. As concentrated calorie carriers, fats also supply the necessary energy for the animal's body. An important function of fat in the metabolism is its ability to reabsorb liposoluble vitamins and pro-vitamins. From the fatty acids, unsaturated fatty acids are particularly important because they ensure the undisturbed development of the skin and scales as well as regulating the entire body's water supply. Protein substances of each food consists of different amino acids that cannot be replaced by other substances. The individual amino acids derived from food are suitable for different animals in a variety of ways to build up the body's natural proteins. From the minerals, the following major elements elements are important: Sodium, potassium, phosphorous, calcium and magnesium. Also important are the trace elements copper, zinc, manganese, cobalt, molybdenum, iodine and iron. They are crucially important for regulating the water supply and for protein metabolism. Chlorides and phosphates must be present in salts. Calcium and phosphates, in balanced proportions, are exceptionally important for bone construction and maintaining stability. The body requires vitamins to support the flow of essential processes. Vitamins resemble catalysts, i.e. they intervene with controlling the metabolism, without actually supplying energy themselves or serve as building material for constructing body cells. A healthy body can only produce a few of them itself and not always in sufficient quantities. If a sufficient quantity is not available, deficiency symptoms begin. A number of defects due to a lack of vitamins are known in amphibians and reptiles. For example, to little vitamin A can lead to eye inflammation or eye damage. Bone damage in amphibians and bone softening in reptiles is caused by a lack of vitamin D. A shortage of the B-complex vitamin is significantly involved in digestive disorders, paralysis and skin damage. To prevent such deficiency symptoms and to be able to offer the animal optimum nutrition at all times, NEKTON has developed a range of products that enable specific care with the various nutrients and active substances. Due to the diversity of the different reptile and amphibian species, it is difficult to specify a precise dosage. It usually depends on how much liquid or the amount of feed the animal takes in. A green measuring spoon is attached to each bottle of NEKTON-Rep-Color. 1g of NEKTON-Rep-Color corresponds to one measuring spoon. Feeding recommendation: 0.25 g NEKTON-Rep-Color per kg of body weight daily, or respectively 1.5 g once a week. The NEKTON measuring spoon inside holds 1 g.
Storage: NEKTON-Rep-Color should be stored dry and out of sunlight, between 15° and 25°C.